"There are certain people that are marked for death. I have my little list of those that treated me unfairly." Well, I don't think anyone is surprised to learn that J.lo the fur killa has a list of people who treated her "unfairly". Because that is totally something that a sane person like J.lo would do. Hmm...I guess this means I'm getting on that list now...SAVE ME! 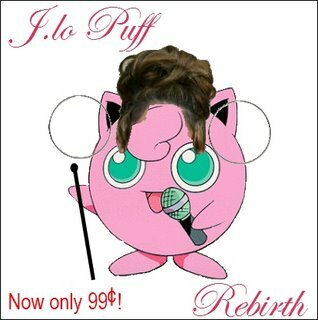 My best friend and I have this inside joke that Jennifer Lopez looks like Jiggly Puff from Pokémon. Now I might have slightly altered this photo but tell me you don't see the resemblance! If I do say so myself, this is my best work with photoshop. J.lo puff don't find this very funny...I WILL USE YOU AS A COAT!